HOWARD WINKLER is the founder and principal of Winker Dispute Resolution. With over 30 years of problem-solving experience, Mr. Winker established Winkler Dispute Resolution as a means of assisting parties to resolve their disputes through negotiation, mediation and advocacy. Mr. Winkler has a well-deserved reputation in the Ontario legal community for good judgment and his practical, fair approach to conflict resolution. Mr. Winkler has been a Certified Specialist in Civil Litigation for most of his career. Mr. Winkler represents both plaintiffs and defendants in complex factual and legal disputes both at trial and at all levels of Appeal. Prior to establishing Winker Dispute Resolution, Mr. Winkler was a Senior Partner at a major Toronto Law Firm. Mr. Winkler is Harvard Law School trained in dispute resolution and negotiation. Mr. Winkler now limits his litigation practice to cases and causes which he feels are of public importance or advance the law in areas of interest to him. This includes disputes in the areas of libel, slander and reputation management. For an example of some Mr. Winkler’s recent cases, see the Court Decisions and Articles sections of our website. Mr. Winkler has assembled a talented team of associates and clerks who allow him to represent clients in matters of any complexity and size. There is often overlap between the areas of practice engaged in by Mr. Winkler and Intellectual Property law. In this regard, Mr. Winkler has established a close working relationship with Mr. John Simpson, the founder of Shift Law, to provide the necessary subject matter expertise to provide full service to clients. Shift Law was recently peer rated as one of the Top 10 Intellectual Property Boutique law firms in Canada. Acting as a Mediator has become Mr. Winkler’s passion. This is now the main focus of his practice. He has developed a unique Risk Management approach to mediation which recognizes the benefit to the parties of retaining control over the dispute resolution process, rather than exposing themselves to the uncertainty of having strangers (arbitrators, Judges or a Jury) decide their fate. To learn what Mr. Winkler has identified as 4 critical stages of the mediation process, click here. Howard Winkler is honoured to have been peer rated as a Best Lawyer in Canada in the area of Defamation and Media Law. Mr. Winkler has been the recipient of this distinction in every since the inception of the Best Lawyers program in Canada. 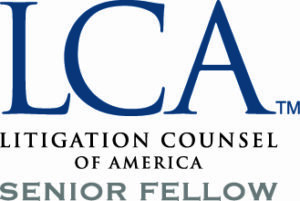 Appointed as a Senior Fellow of the Litigation Counsel of America, Trial Lawyer Honorary Society. Contributing Author, Bullen & Leake Canadian Precedents of Pleadings (Carswell). Described by CBC as one of the Country’s leading experts in Defamation Law.